U.S. Army veteran Nick Harrington served for six years, with deployments in Saudi Arabia and Kuwait. Upon his return to the United States, Harrington was eager to further his education at the University of Baylor in Waco, Texas. Tragically, in June of 2016, Harrington was diagnosed with thyroid cancer; it was so urgent that they immediately scheduled surgery. Since then, he has had 81 lymph nodes in his neck removed, and the doctors have found traces of cancer in his neck that will require further treatment. Even though Harrington is getting the treatment he needs, this road has been anything but easy. He had to sell his car to make ends meet. He didn’t know where the money would come through for basic life necessities. 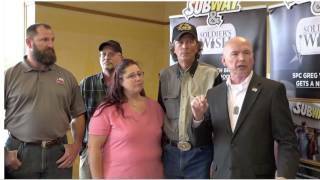 That’s when Soldier’s Wish and Subway stepped in to help this brave young man. When he stepped into the Subway store one February afternoon, he had no idea that he was about to receive the help he needed. 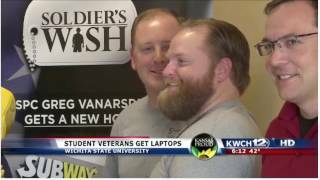 Soldier’s Wish, along with Subway, are working together to pay for Harrington’s housing so that he can go to school without worry. “This is going to give me a little more breathing room and let me relax. I can’t thank everyone enough for all the support,” Harrington told us.